GoDaddy is my choice for Domain names and hosting. GoDaddy is the world’s largest domain name registrar. Live tech support is open 24/7/365 … All day, every day. When you’re ready to create your blog or website, call GoDaddy. They will register your domain name … even help you find a good one. Help you choose the best hosting account options. Guide you thru the WordPress.org installation. And answer any questions along the way. 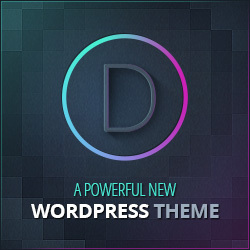 It’s easy to create and modify pages using the Divi modules. shrink and grow to match any computer or mobile device. Click the image to learn more about Divi and see a live demo. When you purchase a membership with Elegant Themes, you can use any of their 87 themes.